Features: STOA TAC Certified Tiger #0613 - Delivered new to California and complete with extensive documentation, ownership history, factory hardtop, original steering wheel (not installed) and original Certificates of Authenticity. NOTE: Our listings are rather lengthy. They not only describe this particular car but also some history of the make/model, considerations in buying a classic car and facts about our firm. However, we continually hear from out of state / out of country buyers (many of our clients) that they prefer the level of detail that we provide. However, if you are not prepared to read the full listing, please read the OVERVIEW below along with the PHOTOGRAPHS at the bottom. Please contact us at 925-846-1451 if you have an interest in purchasing the car prior to the end of the auction. This car is offered at a realistic price and, unlike bidding on cars in an auction environment, you will have the benefit of extensive information and history on the car prior to making a buying decision. Equally as important is the fact that Classic Cars Ltd. has been in business for over 25+ years and enjoys an excellent national / international relationship with nearly 1,000 positive eBay feedback responses. Please keep in mind that we will gladly…. Keys as follows: Ignition/Doors RM 832 lock barrel, Secondary (Console/trunk) was barrel code FS 890. Employing a similar formula to the AC Cobra, the Sunbeam Tiger represents the quintessential British sports car with a twist. Using the modified chassis and body of the four-cylinder Sunbeam Alpine combined with Ford’s venerable small-block V8, the prototype of the Tiger was constructed by Shelby at Sunbeam’s request. The resulting car was put into production, which was handled by Jensen, and just over 7000 examples were constructed between 1964 and 1967. The Tiger was manufactured in three series, Mk. I, MK IA, and MKII. The MK IA was built in extremely limited numbers with only 2,706 examples constructed between August 1965 – September 1966. This Tiger being the 457th MK IA produced in 1965. The body is straight with good panel operation and fit, and the paint shows well, with a few blemishes on close inspection, but an overall presentation consistent with a car that has covered few miles over the course of several years. The body is free from damage and all of the proper Tiger bright work, emblems, and trim is in place. The chrome is in nice condition with a few swirls and light scratches. Glass and lights are excellent, and much of the trim has been replaced over the course of the cars lifetime. The interior was restored to high standards and remains in excellent shape. The upholstery and carpets are beautiful, both in terms of condition and workmanship. The dashboard was restored in its entirety, including the upholstery, wood, instruments, and switches. A high quality Moto-Lita wooden wheel is currently in place and the original; factory correct banjo spoke steering wheel is included with the car. The dashboard wood is in exceptional condition, as are the instruments, switches, and controls. The engine compartment includes many original items including the air cleaner and other components. Some bolt on high performance items can be seen including an Edelbrock performance manifold and Holly 4 bbl. carburetor. Valve covers are alloy an imprinted with “Tiger.” Recently, an oversized aluminum radiator has been installed (the original radiator is also included). The engine compartment is tidy and free from excessive dirt, grease and signs of leaking. The trunk presents well and includes the spare tire, spare, and jack. The upper trunk cover has the proper strap to hood it in place and has been recovered over time. The Tiger comes with a tool roll that appears to have all of the correct tools and bits, and is in very good original condition (refer to photos). The undercarriage can be seen in the photos and is original condition and we see no signs of rust through or noticeable damage, current or previous. The underside is relatively dry and the inspection reflects rear brakes being converted to disc brakes resulting in 4 wheel disc brakes on this car. The Tiger has benefited from maintenance to the front suspension and an upgrade to Koni shock absorbers. Some time ago, a remote oil filter was fitted but the car retains its stock exhaust configuration and is not fitted with headers. The car runs and drives very well. It is a tight example, with minimal rattles, taut suspension, and quick, precise steering. The throttle is linear and responsive and the engine runs very well, starting easily and showing good carburetion. It makes very good power and the V8 pulls the car authoritatively while wonderful sound through the cars dual exhaust. The brakes are effective, and the gearbox has a robust but precise feel. This is an excellent opportunity to acquire a well-documented, genuine Mark IA Tiger at an attractive price. It has had the benefit of relatively few owners from new and is a wonderful car to drive. The Tiger has received considerable ongoing maintenance and reairs over the years including a bare-metal respray and complete restoration of the interior and top. It is a well-resolved and nicely dialed-in car that is ready to enjoy. It is complete with hard top, comprehensive documentation, tool roll, and jack. Seeking more performance for this trusty if timidly styled four-cylinder roadster, Rootes contracted with Shelby for a prototype with Ford small-block power. Dubbed the Tiger — after Sunbeam’s 1928 land-speed-record car — it debuted at the 1964 New York Auto Show and soon went into production in England. 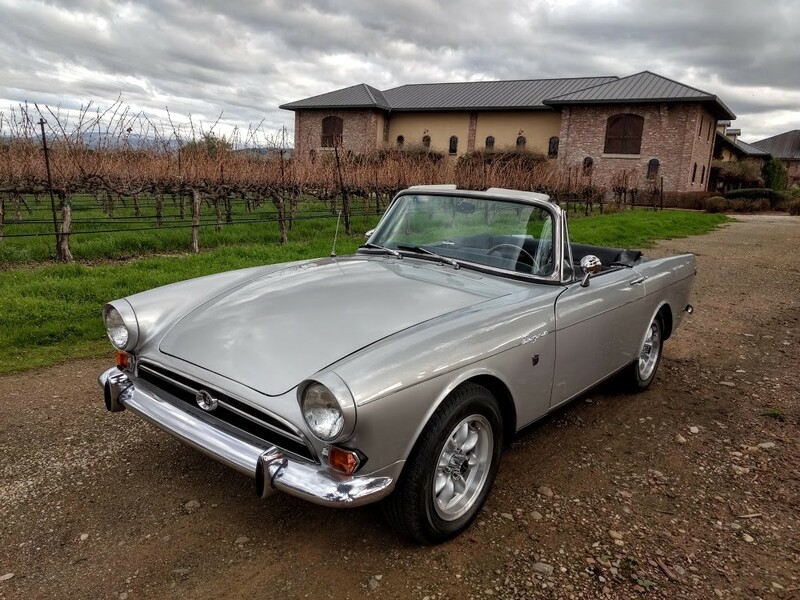 At $3499, the Sunbeam Tiger found 6495 buyers before the MKII Tiger went on sale in 1967 (the MK IA was introduced in 1966 but was largely the same car as the ’65). It had Ford’s 289-cid V-8 with increased horsepower badging that read “Sunbeam V-8” instead of “Powered by Ford 260.” Zero-60 times fell two seconds and top speed rose five mph. Most Cobra speed equipment could be fitted, including dual four-barrel carbs for up to 300-hp. Sunbeam Tigers were production-class road-racing threats in America and rally winners in Europe. On the street, they were significantly quicker than the last of the big Healey’s or the first of Triumph’s six-cylinder TRs. But it didn’t matter. Chrysler had bought into the Rootes group in 1964 and couldn’t countenance a Ford-powered car. The Sunbeam Tiger II was unceremoniously dumped during 1967. Please review our feedback on eBay (user name Never22Many) representing close to 1,000 positive transactions to buyers all over the United States / World.